Steemhunt is a website build on top of steem blockchain that allows author to hunt for new and cool products. Since the backend server was written in Ruby on Rails, it requires front end contributors to know a little bit knowledge about ruby on rails in order to contribute. Other pain about using ruby is installation on Windows. Therefore, I decided to dockerize the back end Ruby On Rails server in order to help out the front end developers to work on front end web without hassle on setting up the back end. From the commit history e2cfbf6d39e3271e28bd5cc0a746fff5f08de23c, I tried a few attempts for setting up both back end and front end with ruby bundler command and use a different environment variable called docker, but my final choices ended up back to the basic one. The Dockerfile is used to pull Ruby images from docker and move all the files. docker-compose.yml file is used to setup PostgreSQL server and link Rails to PostgreSQL. Then, port 5432 is open for PostgreSQL and 3001 for Ruby On Rails API server. The following on commit e8f50f3bd49549baaa43edd3de7b6c86a77313d4 was discussed with @tabris the lead developer of SteemHunt, where we decided not to create a new environment, and stick back to dev environment, the commit was done to delete the duplicate codes. 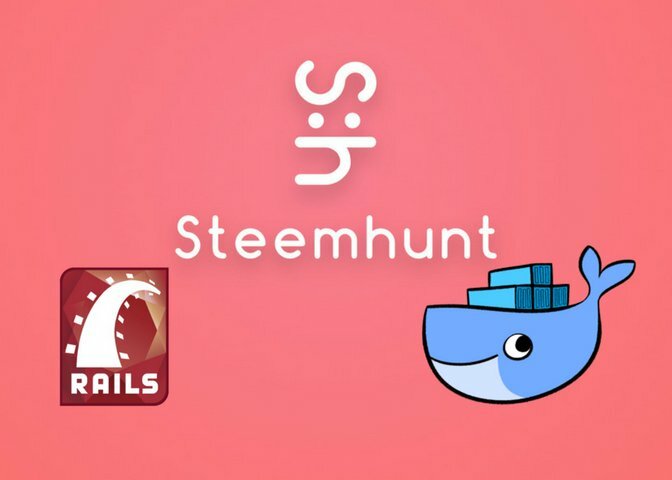 Steemhunt is a website build on top of steem blockchain that allows author to hunt for great products. Steemhunt is open source on GitHub, where there are 2 seperate repository to seperate the front end and backend. I had written a tutorial on setting up the environment for back end and front end. The back end server is build with Ruby On Rails and PostgreSQL. The front end web is build with React.js with Redux.